Wearing accessories can either make or break your entire look and sad to say majority of the people do not know how to buy accessories that will match their attire. That is why, you need to choose and find the perfect fashion accessories for your outfit. You need to consider the color, scale and style of pieces and occasions you are going to attend. However, here are some tips and tricks in choosing the right accessories for your outfit. If you are wearing plain colors like black or white, you can wear any colored accessories and jewelries that are look classy and stylish. But if you wear colorful outfit, choose the color of your accessories that are opposite to your outfit and to make it easier for you, you can take a look at the color wheel. You will see lighter and darker shades of every color and make sure you only use 1 or 2 colors to complete the whole ensemble. Chan Luu jewelry and accessories has wide variety of collection to choose from. You should also know to keep the balance or scale of your fashion accessories. As what everyone says, less is more, meaning wear simple and not too complex accessories to give highlight to your outfit. You need also to identify your signature outfit and not just because it is the latest trends in the fashion industry. Pearl or diamond earrings and silk scarf is ideal for classic attire while chandelier earrings and bib necklace is perfect for glamorous and elegant attire. 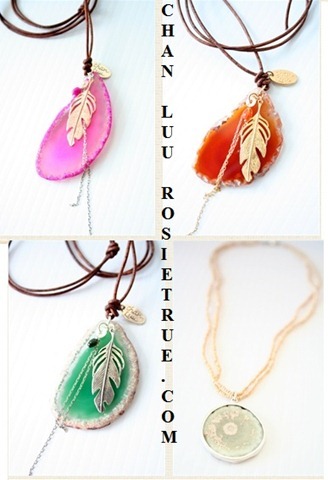 For casual attire, you may pick some of the collection of Chan Luu jewelry and accessories. Scarves are also one of the best accessories because of its neutral tones and timeless patterns which can be paired any type of outfits. In general, accessories and jewelries are worn to give more emphasis to what you are wearing so don’t over accessorize. Wear complementary pieces of jewelries and accessories because matching sets of jewelries are quite dull, boring and less sophisticated. You don’t need to buy highly expensive ones instead purchase those accessories that are quite affordable but fashionable.